The wind was decidedly fluky for Sunday's racing, but the race team got all fleets away after a short postponement. The wind started at around 10 knots, easing through the day to a minimum of 3 knots of Northeasterly, but the race team fitted in two races to leave competitors smiling as they came off the water – despite some large shifts that meant no position was set in stone until the final tack to the finish line. A strong weather-going tide meant that there was a general recall or two, but fleets subsequently got away cleanly – no doubt encouraged to be cautious by the Z flag flying from the committee boat. First away was the IRC 0 class. Cornel Riklin's Jitterbug added two more firsts to continue her run of bullets, making her lead look healthy and strong after three weekends of racing. Fellow J/111 Journeymaker II took two second places, ahead of J/122 Juno in third, making for a complete J-boat podium at this stage. In IRC1, Philip Farrands' Old Mother Gun made the best of the shifty conditions to take two first places on Sunday, bringing them to within two points of overall leader, James Wilkie's Fast-Tack Puma, in the overall standings. HOD35 Malice increased her overall lead in the IRC2 class, scoring two more firsts to add to her near-perfect scoreline. Mike Bridges' Elaine took two second places, with J/88 Jongleur finishing 3rd in both races. In IRC3, J/97 Blackjack II recorded two wins, rounding off a weekend of celebration as owners Annie Kelly and Andy Howe got engaged on Saturday. At the prizegiving, day sponsor, the Bugle pub presented them with a special champagne bottle to add to their day prize, to tumultuous applause! J/92s Upstart took two second places to add to their consistent scoreline. The J/109 fleet, racing with IRC3, was won by Simon Perry's Jiraffe, which took two bullets ahead of Joe Henry's Jolly Jack Tar's two second places. Day prize in the Sigma 38 fleet went to Chris and Vanessa Choules on With Alacrity, who recorded a 2nd and a 1st, with Nigel Goodhew's Persephone scoring a 1st and a 2nd. IRC 4 saw some chopping and changing, and the first race was won by Sigma 33 Stan the Boat, with Impala 28 Polly in second and fellow Impala Uproar in third.. Polly won the second race, with Mustang 30s Respect and Erik the Red close behind. This leaves things tight at the top of the results. The Impala 28 class, racing in IRC4, was won by Polly, with Uproar and Imptish just behind, sharing equal points after the day's racing, with Imptish edging ahead on coutback. Thanks go to the Bugle pub, who as day sponsors donated the prizes –meal vouchers and bottles of wine - in a packed HRSC clubhouse after racing.We look forward to seeing all competitors on the water next Sunday. The final weekend of the Doyle Sails Hamble One Design Championships didn't come with a promising forecast, but the race team, headed by Dermod O'Malley, got all races away on Saturday and Sunday in an oscilating N/NEly wind. This series, featuring racing for J/70, J/80, SB20 and mixed sportsboat classes, has seen some close and exciting racing, and competitor feedback has been very positive for the four days of racing, in which 10 short, sharp races were sailed with a quick turnaround between races. This weekend in particular saw boats splitting tacks up the beat to take advantage of the numerous shifts, some reaping their rewards and others losing out as they neared the windward marks. Points-wise, no boat had it all their own way in the J/70 class, but it was Tom Forrester-Coles' Harlequin that took home the trophy, finishing the series with 18 points, six points clear of second-placed Jugador, belonging to Jack Davies. The podium was completed by Greg Hall's RTYC 742,with 32 points. Things were extremely close at the top of the J/80 class, where it came down to the final race to decide the winner. Phil Taylor's J.A.T and Yannig Loyer's J out of the box finished tied on 13 points apiece, but it was J.A.T that squeezed ahead on countback with one more first place. Michael Lewis' Jester had a late run of success, taking first place in the final three races which brought her to within three points of the two leaders and clear of Jumblesail in fourth place overall. In the SB20s it was Richard McAdam's Here Comes Bod that took the series, despite missing the first two races on Saturday. Niall Peelo's 3-SOME took second overall, 5 points ahead of 6a Vision Homes and Turbulence Too, who were tied on points but who finished in that order on countback. Steph Merry's 1720 Midnight Cowboy took the mixed sportsboat class with an impressive number of 1st places. J/92S Wizard was second. And with that, the 2015 Doyle Sails Hamble One Design Championships conclude after some close racing in tricky conditions. 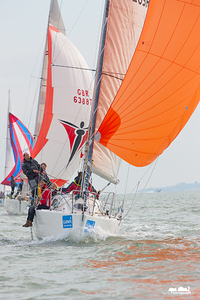 We look forward to seeing entries from as many classes as possible next autumn, and would like to thank all competitors and Doyle Sails for their support of the event. 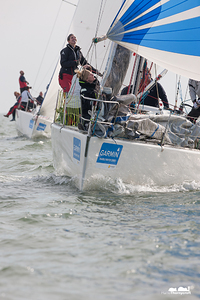 The Hamble Big Boat Series, run alongside the One Design Championships on the 2nd and 3rd weekends of the Garmin Hamble Winter Series, offers top-notch racing for some of the best-sailed big boats in the country. This year one crew, that of GP42 Hispaniola, travelled from Scotland to race having only just bought their boat in Germany– missing the first race thanks to their plane being delayed. The biggest boats raced in the IRC0 class. This was won by Corby 37 Aurora, with an impressive 6 firsts out of 12 races. Carkeek 40 Mk2 Rebellion took 2nd place, with main series leader Jitterbug in third overall, four points behind Rebellion. In IRC 1, it was Simon Henning's Mumm 36, Alice that won the Big Boat Championship, an impressive 9 bullets giving them a healthy lead over second-placed Premier Flair, who pipped Richard Patrick's Dusty P for second place. Thanks go to all competitors and to sponsor Sailing Networks, for their support, and we look forward to seeing you all on the startline next year. 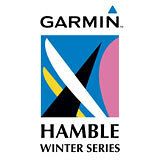 Next weekend sees two more races in the Garmin Hamble Winter Series, before a mid-series break. Hamo Thornycroft (GHWS) and Trevor Pountain (Big Boat Champs).